It’s one of those irritating medical conditions that doesn’t just affect you, but everyone in close proximity. This is one of the main reasons why snoring is posing such a problem for the nation. As we’ll soon find out, the causes for snoring can be far and wide. However, what we will also find is that there are changes you can make to aid the situation, which we will explore through the course of this guide. What can you do to treat snoring? It might have plenty of causes (more on that later) but the scientific reason that snoring occurs is because air is unable to move as freely as it should through your nose and throat whilst you are sleeping. The knock-on effect of this is simple; vibrations occur. These vibrations are what most of us know as snoring. There are several reasons why some people are more prone to snoring than others. Some of you might have too much tissue which causes these vibrations, while the position of your tongue can also make a difference as this also interferes with air flow. We’ll now move onto some of the direct causes which impact snoring. One of the most frustrating elements of snoring is that there are so many causes behind it. What might be causing snoring for one person might be completely different for another. To highlight the point in further detail, let’s take a look at some of the most common reasons why people snore. If you happen to be carrying some extra weight, or just being generally out of shape, there’s every chance that you might be affected by snoring. These are issues which can impact the tissue in your body, with air flow then being affected. Unfortunately, a little ageism comes into the picture when it comes to snoring. As soon as you get to that middle-age period of life, your throat will start to become a little narrower. Not only this, but the muscles in this area of your throat will also get smaller. All of this impacts the air flow which we spoke about in the previous section. If you consume a lot of alcohol, smoke or take certain medications (usually like tranquilizers), there’s an increased chance of snoring. All of this is for the same reason; your muscles are likely to relax and as such impact that airflow that we keep talking about. If you happen to be suffering from any nasal or sinus issues, there’s an increased chance that you might be susceptible to the effects of snoring. This one should be one of the most obvious that we talk about, as your airways will be blocked and it will be harder to inhale. Some sources suggest this is like the vacuum effect, with snoring being the end result. While some of the causes we have talked about are related to your body, this next one is probably the easiest to change. In short, the way in which you sleep can have a direct impact on your snoring. If you happen to sleep flat on your back, there’s more of a chance that the flesh around your throat will relax. The result is that your airway will be impacted, and we all know what happens from that point on. Following on from the above, let’s now take a look at some of the steps you can take to alleviate your problems. As you might expect, many of these are just in response to the direct causes that we have addressed in the previous section, but let’s take a look in-detail to help you in your battle. This was the last point that was raised in the section about causes behind snoring, but considering how easy it is to implement let’s visit it now. As we’ve already spoken about, lying on your back is asking for problems when it comes to snoring. Bearing this in mind, you need to do whatever you can in your power to sleep on your side. Admittedly, this can be something that’s easier said than done, but many people will purchase a body pillow to aid with this position. Other will go as far as attaching tennis balls to the back of their pajamas, just so that it becomes impossible to sleep on your side. Water is seemingly the answer to so many ailments, and snoring isn’t the exception. Fluids within your nose suddenly become much stickier when you are dehydrated, and this can amplify snoring considerably. As such, make sure that you keep drinking enough water – with the typical man advised to consume 16 cups every day. Women, meanwhile, should turn to 11 cups. This is one of those suggestions that most of us know we should do, yet many of us just decide not to. Having a solid sleep pattern can help with a lot of things, with snoring one of these. When you are too tired, your muscles become more relaxed and as so many parts of this guide have told you, this is a principal cause of snoring. This next one isn’t really in response to a direct cause, but if you are struggling with your snoring it’s something that you can do to aid the situation. As we’ve found out so many times, your nasal passages are crucial to solving this problem, so you need to try everything in your power to open them up. One tip is to try a hot shower before bed to do this, while another might be to wear nasal strips which can lift the passages and ultimately open them up more. Allergens are everywhere, and most of us don’t even realize this. The problem is that this is something else that can directly impact snoring as it affects the airflows. Fortunately, there’s a simple solution. If there’s anything that you know accumulates dust, make extra effort to remove it. This could mean replacing your pillows frequently, or even just treating a ceiling fan that attracts the allergens. Over time, doctors have developed several medical procedures to deal with snoring, including Continuous Positive Airway Pressure, Laser-assisted uvulopalatoplasty and Uvulopalatopharyngoplasty – the latter of which is a surgical method. However, most people tend to experience more success by relying on various devices that have been released. These devices tend to attack the root of the problem, although they also tend to be very focused to one cause. We’ll now take a look at Good Morning Snore Solution and AirSnore – which are designed for those of you who snore due to your tongue and jaw position respectively. Developed by doctors, it would be fair to say that Good Morning Snore Solution certainly arrives with a promising reputation. This is a mouthpiece which fits pretty much every mouth out there, and works by gently moving the tongue forward in a bid to clear blocked airways. If you know that your snoring is caused by the position of your tongue, it goes without saying that this might be an ideal solution for you. A slight downside to the product is that mild side effects can occur, with some users saying they have a tender tongue and generate a little more saliva. On a more positive note, these effects tend to disappear once you have got used to the product. Good Morning Snore Solution has been brought to the market by MPowrx, who have now been in business for over thirteen years and are comprised of a team of doctors. They sell this product for $104.94. 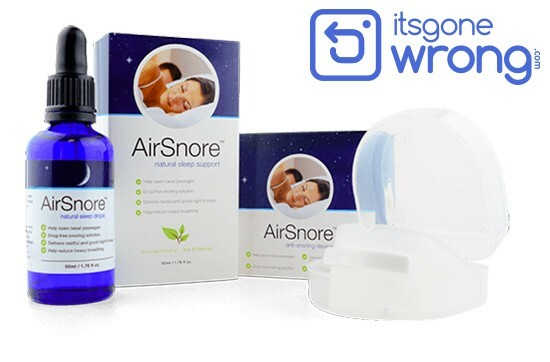 The next product we will look at is AirSnore. In short, this is another simple mouthpiece that is molded to the inside of your mouth. As we have found out through the course of this guide, one of the reasons why snoring occurs is because the airway is not properly open. This mouthpiece addresses this problem, by gently lifting your jaw so that more air can flow through. It’s different to the previous product, but naturally suited to those of you who snore due to your jaw position. The manufacturers are quietly confident about AirSnore, and even attach a 60 day guarantee to the product. Admittedly, it’s not for everyone and some people might not be comfortable wearing a mouthpiece, but if such contraptions don’t bother you this can be something that works very well. The basic mouthpiece is available for $49.95.